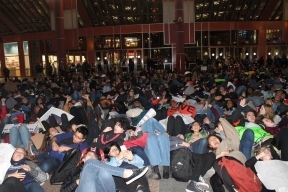 Over 500 CPS students took over the grounds at James R. Thompson Center last Friday to urge the State Government to pass a budget that will fund the Chicago Public Schools. Students representing Jones College Prep, Walter Payton College Prep, Kennedy HS, and Kelly HS, including speakers Alderman John Arena and State Representative Will Guzzardi vocalized their disapproval over the future of Chicago public school students. 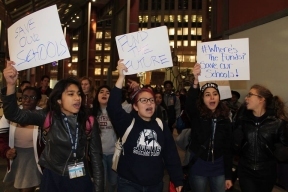 “Without the cooperation of the State Government, Chicago Public Schools are in danger of losing 5,000 employees cutting popular classes that are not required for graduation and drastically increasing the size of classes that remain,” said one student from Walter Payton College Prep. Students at the rally and even through social media platforms addressed Governor Rauner and Mayor Emanuel to demand more funding. “The 400,000 students of the Chicago Public Schools, their parents, and the 5,000 teachers that would be laid off, do not deserve to be affected by the political disputes in Springfield,” said Ald. Arena.